At one time London’s St James’s Market was a thriving, bustling site of food and commerce, a labyrinth of market stalls and provision shops, fishmongers, grocers, shoemakers and periwigmakers, housed in the narrow lanes bordered by Haymarket, Piccadilly, St James’s Square and Pall Mall. Founded in 1663, it was demolished in the early 19th century, along with the surrounding houses, and moved to make way for architect John Nash’s vision for a grand, new Regent Street, a ceremonial route connecting the new Regent’s Park with the Prince Regent’s mansion Carlton House in St James’s. This wide thoroughfare was to be a place for nobility and the well-to-do, not butchers and bakers. For years the isolated, compact backstreets between Haymarket and lower Regent Street lay lost and forgotten, known only to savvy taxi drivers as a shortcut past Piccadilly Circus or for local workers on a fag break. Now, 200 years after the market stalls closed up shop, The Crown Estate and Oxford Properties Group is investing £400m in a decade-long programme to re-establish and restore the historic market site — as a vibrant, but this time luxury shopping and dining destination. 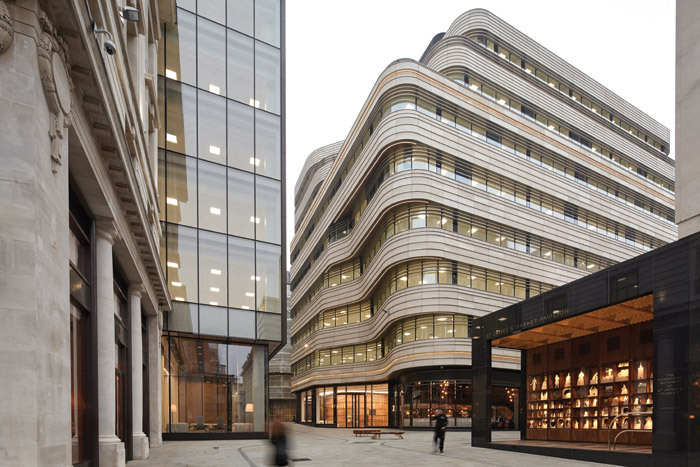 The St James’s Market scheme itself is part of £500m-worth of improvements and conservation efforts The Crown Estate is making to its buildings and public realm in St James’s, of which it owns 50 per cent, including 370,000 sq m of retail, office and residential space. The first major project was Eric Parry Architect’s One Eagle Place (2013), a £45m redevelopment of five buildings on Piccadilly crowned by a multicoloured cornice by sculptor Richard Deacon (see Blueprint 326, May 2013). 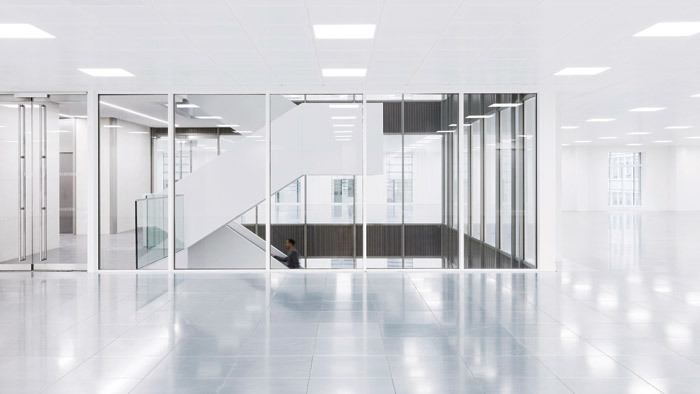 Last year, forward-thinking fashion store Dover Street Market made an unprecedented move from its birthplace on nearby Dover Street to Haymarket, signalling a change from cinemas and dingy nightclubs to high-end fashion and upmarket stores. 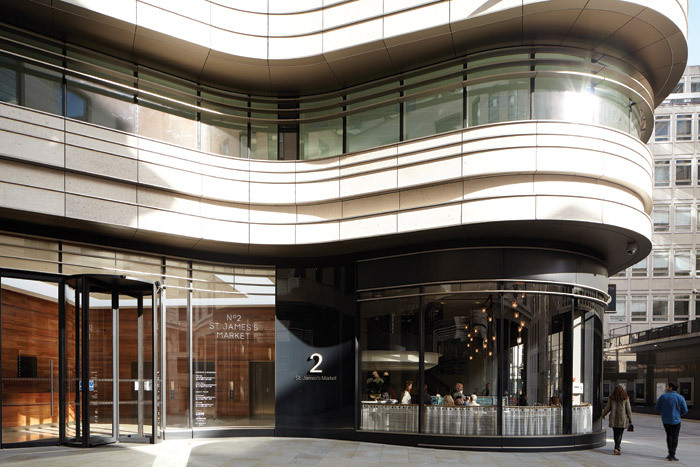 With the first phase completed at the end of last year, the St James’s Market site has been opened up to provide 19,500 sq m of office space, with six flagship stores and seven restaurants, all centred around a new pedestrianised public square where the market once stood. Designed by Make Architects, the holistic scheme aims to connect the site back to its wider urban context, integrating the old and the new with the public realm. It is a lesson in place-making, transforming this neglected, nondescript back alley into a stylish hot-spot people want to be in and be seen in. ‘The aim was always to bring what is west towards the east, to try and relink Haymarket and bring an uplift to that side of St James’s,’ explains James Roberts, project architect and partner at Make. The development is made up of two key blocks — 1 St James’s Market (1SJM) and 2 St James’s Market (2SJM). 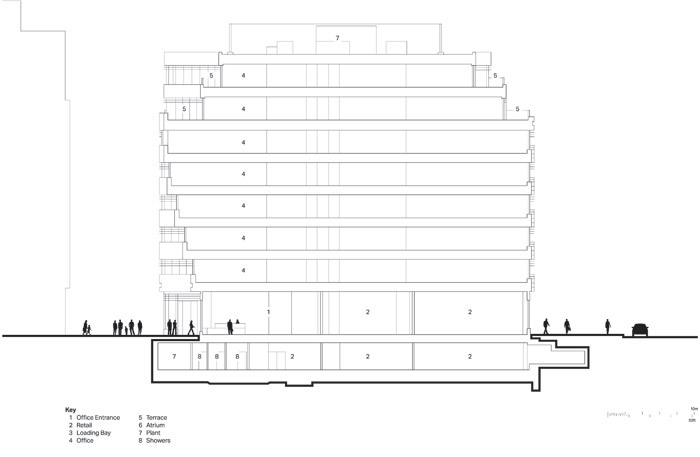 Both are deliberately orientated with office entrances opening on to the new 950 sq m public space in the middle rather than the main streets, to help animate the space with people coming and going. Smart shops and restaurants line the outer edges along Haymarket and Lower Regent Street (now renamed Regent Street St James’s) and lead into the central space along Norris and Carlton Streets, spilling out of their shopfronts with tables and chairs. The original backstreet layout has remained the same, but the space has been levelled and resurfaced in light Yorkstone to create a pedestrianised enclave. Granite ribbons and metalplaque inlays guide passersby in and denote the re-established form of St James’s Market. ‘We’ve kept it so there’s no direct east–west view; you come into this space and are enclosed within it. 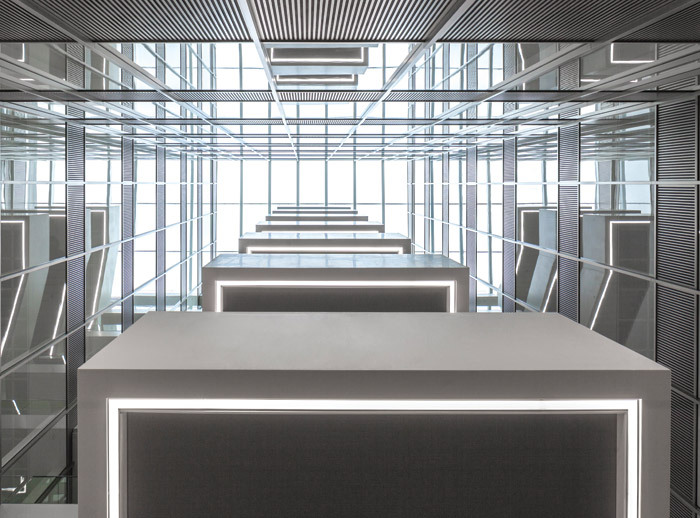 It’s not a through road, you have an end point that catches your eye and you know you’ve reached a destination,’ says Vicky Brown, project architect and partner at Make. Landscaping and integrated seating has been kept to a minimum, bar four unique benches designed by London-based Studio Swine that are part of the market’s public arts initiative. Inspired by the traditional trades that have populated St James’s for centuries, from shirtmakers to shoemakers, the designs feature zig-zag patterns that echo the intersecting threads of the weaving process. A permanent art pavilion by Studio Weave facing 1SJM and 2SJM tells the rich history of the area through a bawdy ballad written during the market’s heyday, and narrated by Stephen Fry. 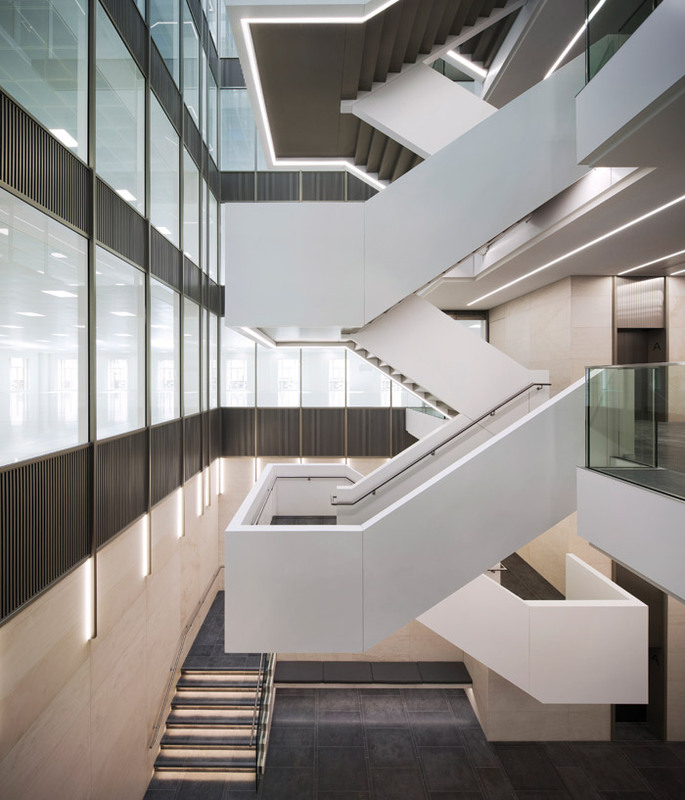 1SJM — the new home of The Carlyle Group and The Crown Estate — provides 13,500 sq m of office space and an impressive, double-height reception. 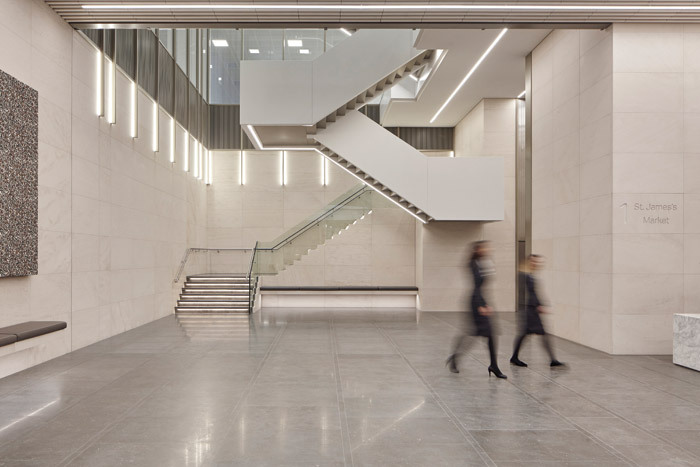 The entrance is marked by an eight-storey glass fin wall inlaid with a fine copper mesh that glints in the sunlight and marks where the old, retained facade stops and the new-build facing St James’s Market begins. Explains Brown: ‘It tells the story of what has historically been in the area: there’s Jermyn Street nearby, the fabrics, the dandy man.’ The proportions of the new stone facade (also Portland stone) are modelled on the old, while a zinc mansard roof features modern versions of the dormer windows. ‘It’s about being respectful to what was there before and giving it that sense of upmarketness, to emphasise this is a high-end, quality place,’ adds Brown. The classical Regent Street St James’s frontage of 1SJM required substantial restoration work — the Portland stone was cleaned and rebuilt where needed. The mansard roof was raised by 1.2m to create more useful space for modern offices, and the diminishing slate design on the mansard, the dormer lead work, timber window mouldings and ornate lead cartouches were painstakingly reinstated by specialist craftsmen to the original design. 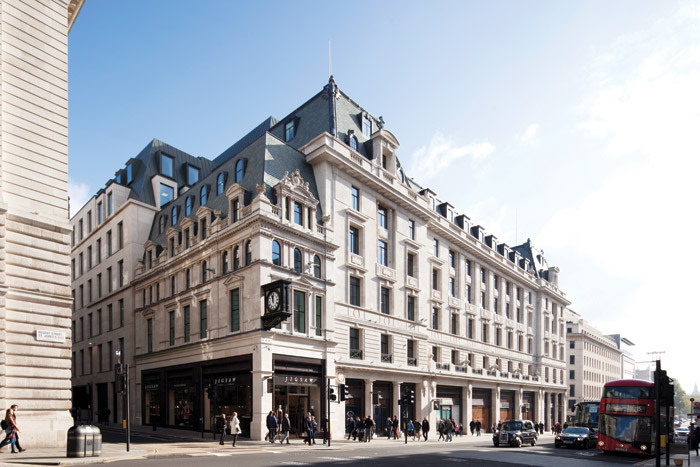 The oldest part of the building, the small, north-west corner facade of 22 Regent Street, wasn’t originally part of the scheme, but the design process identified that its purchase would create a much more coherent frontage towards Piccadilly Circus. 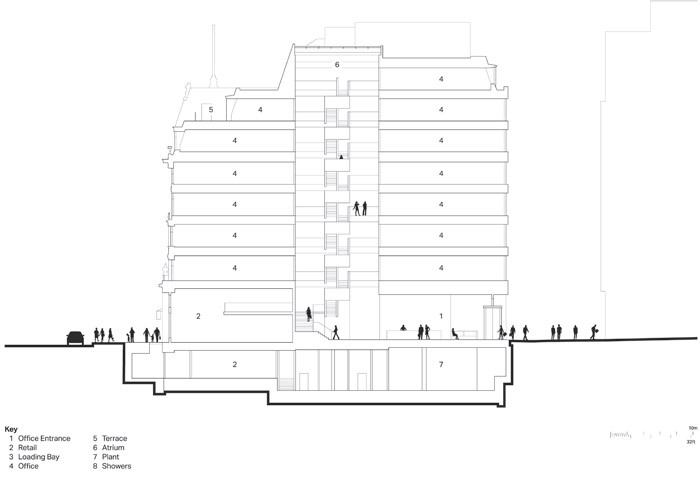 ‘I think it really grounds the building, it really gives it its identity,’ says Brown. 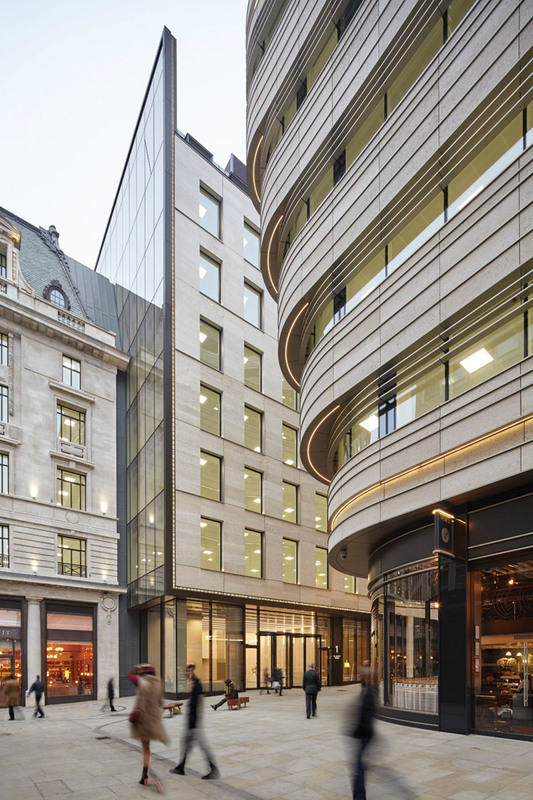 The ground floor was reconfigured to create 7.5m-high bronze shopfronts on to Regent Street St James’s for the likes of Jigsaw and Smeg, with a loading bay for both buildings behind. 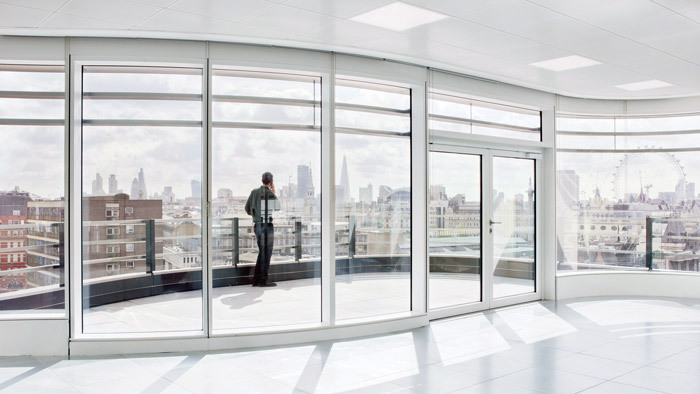 Opposite at 2SJM, 6,300 sq m of flexible office space is arranged across seven floors. It’s a much more contemporary space compared to 1SJM — Make envisions it being used by a young media company rather than a corporate firm. 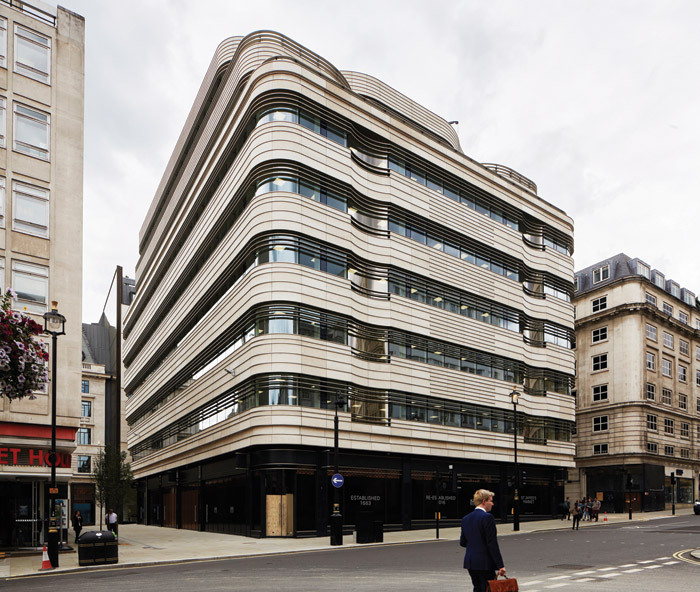 The building is clad in ribbons of Portland stone inlaid with delicate metal bands, which give it an art-deco feel and pick up on the glitz of the bronze shopfronts and fin wall. The curves kink in at the St James’s Market corner to form the concave glass entrance. 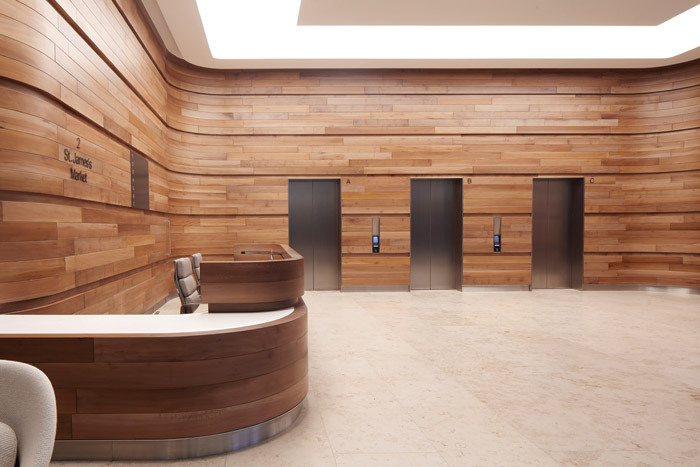 Internally, the simple lobby — much smaller in scale than 1SJM — is wrapped in dark London plane timber. The curved facades of the light, spacious upper floors weave in and out to form terraces with breathtaking panoramas across the rooftops of London. 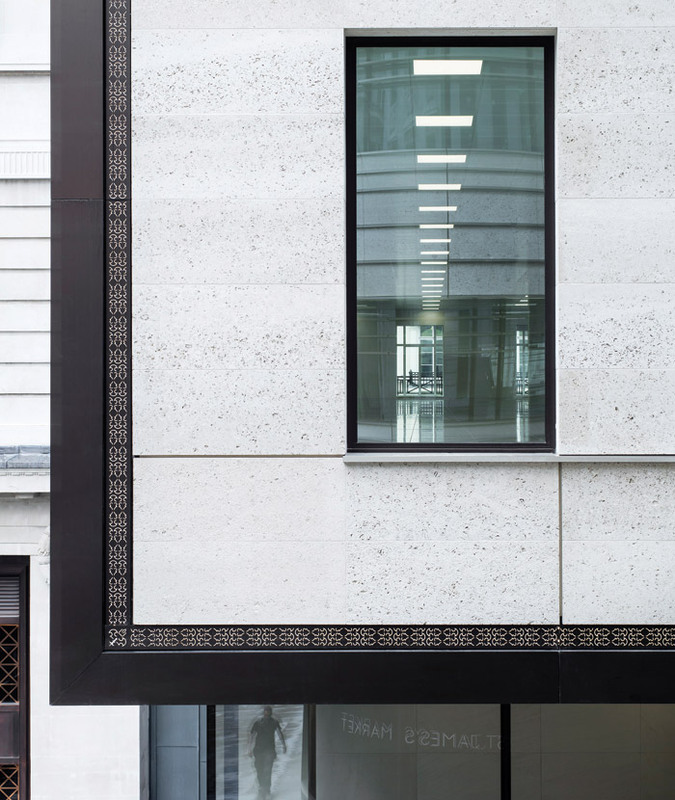 The quality and exquisite level of detailing put into this project has created two beautifully dignified buildings that respectfully pay homage to the heritage of Nash’s London. Finally this forgotten, rundown end of St James’s has received the investment it needed to get it on a level plane with upper Regent Street. Now, the bustle of activity is back and Haymarket has gone upmarket.